With one hectic and busy work and family life, I almost missed the blog milestone! Yes… Today Monsoon Spice turns 6 years old or young :) It’s been exactly SIX years since this blog was born on a lazy afternoon! Wohoo… SIX YEARS!!! I know I need to stop repeating the same thing again and again, but I find it difficult to believe that my love and passion for food blogging is still going strong after all these years! For someone who believes 'change is the only constant in life', sticking to the food blog scene for this long is nothing short of achievement! The journey so far has been exciting, educating and humbling experience. There have been a lot of ups with very few downs but all in all it has been really delightful experience. I have made many friends whom I have never met in real world. They continue to support, encourage and inspiring me, and I am grateful to have them in my life! Then there are you, my dear reader friends, who motivate me to continue this adventure of cooking, clicking and blogging with your kind and positive comments and feedbacks. The love, friendship and happiness that your shower on me not only makes it worth to blog but also enrich my life! Thank YOU one and all who have made this virtual place a really happy place to come and share my thoughts, experiences and recipes. You have been too kind to listen to all my rants and ramblings and still continue to support me and this blog. This post will be just a half cooked cookie if I leave out mentioning my family :) My two men army with my dear and near ones continue to inspire me everyday! They deserve the major chunk of success that Monsoon Spice has achieved all these years! They happily let me share the snippets of our life and also the recipes that are churned in our kitchen to be shared with everyone in this virtual world. The food blog Monsoon Spice has become a place where people with passion of food, spice and life come together and share their success stories peppered with some kitchen disasters :) Thank you one and all for walking with me in this adventurous, yet delightful, food journey all these 6 years. 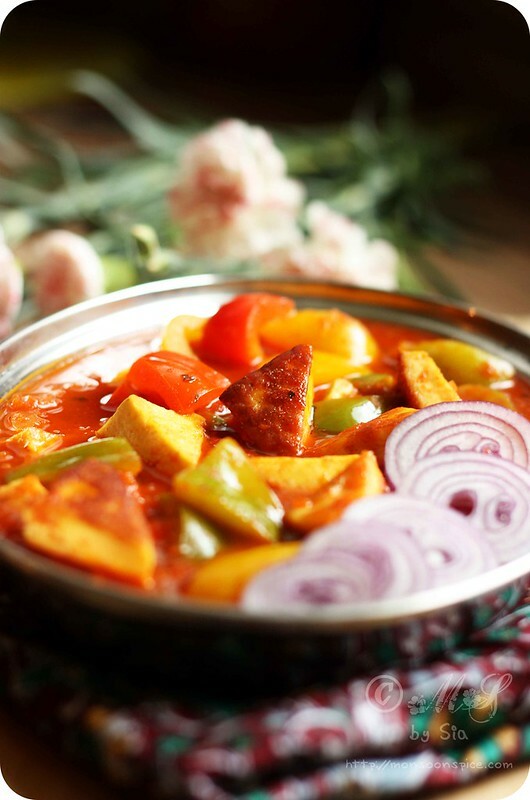 Heat ghee/oil in a pan and arrange paneer pieces in a single layer. 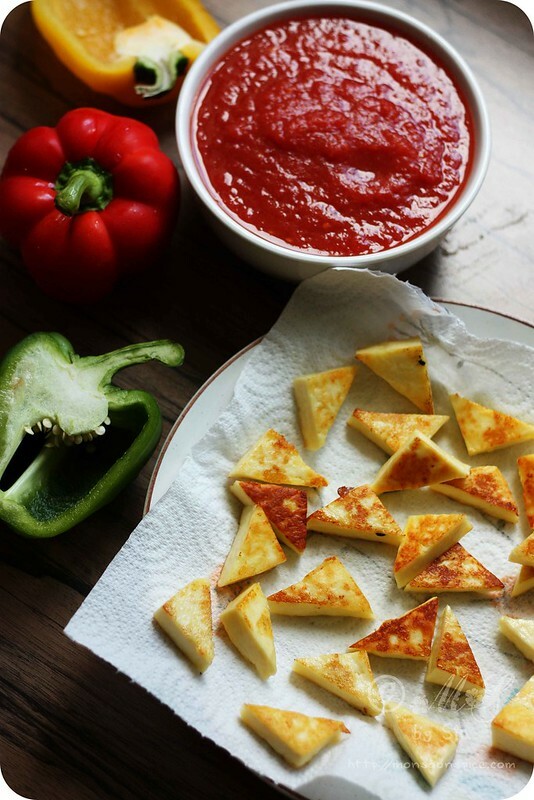 Fry these paneer pieces on low flame till the sides turn golden and gently flip them over. Let the other side too turn to golden colour and then place these fried paneer in a bowl of hot water. this helps keeping the paneer pieces soft. Next heat a tbsp of oil in a pan and add cumin seeds to it. When cumin seeds start to sizzle and change colour, add finely chopped onions. Sauté the onions till they turn golden, about 2-3 mins, on medium flame. Add turmeric powder, coriander powder, red chilli powder, garam masala and kitchen king masala, if using, and mix them well. Add tomato puree and mix them all well. Let it cook for 5-6 mins, mixing in between, till the raw taste of tomato disappears. Mix in 2-2½ cups of water and salt to taste and cover the pan with a lid. Let the gravy come to gentle boil, about 6-8 mins. 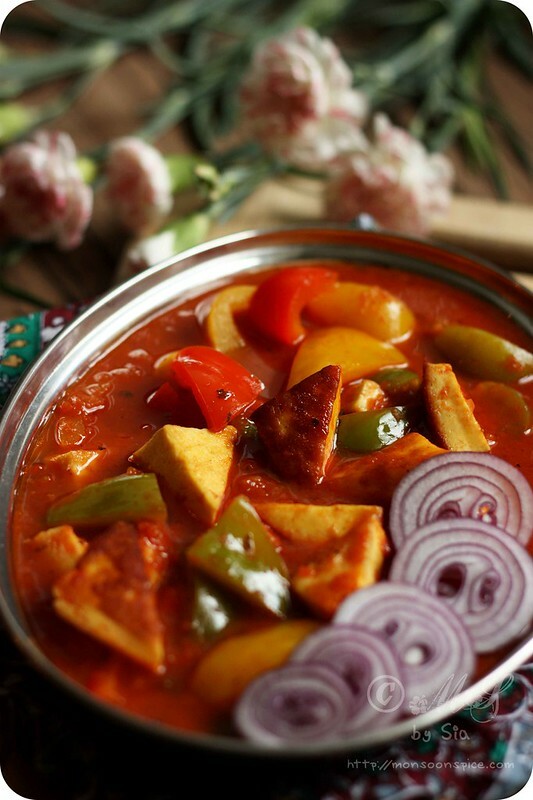 Add paneer pieces and the bell peppers and let it simmer for 4-5 minutes for all the flavours to blend well. 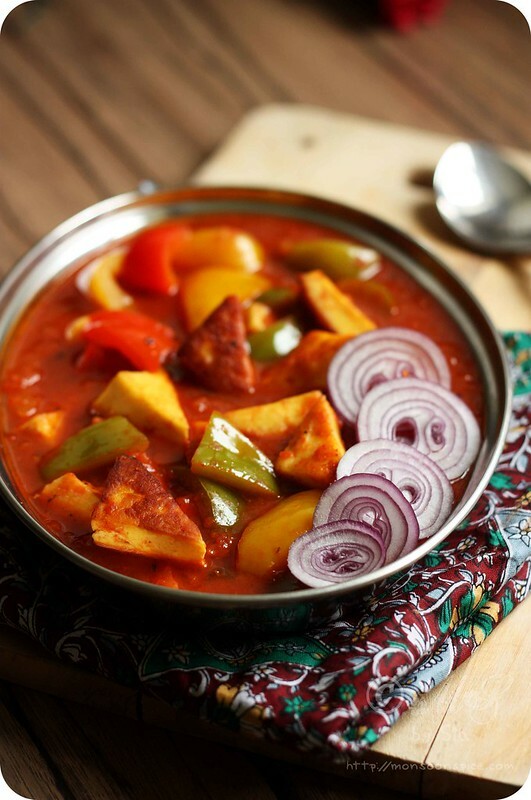 Serve this delicious Paneer Pepper (Capsicum) Curry with any Indian flat breads (Whole Wheat Naan or Butter Naan or with any stuffed parathas) or plain/flavoured Basmati rice. Heaven! 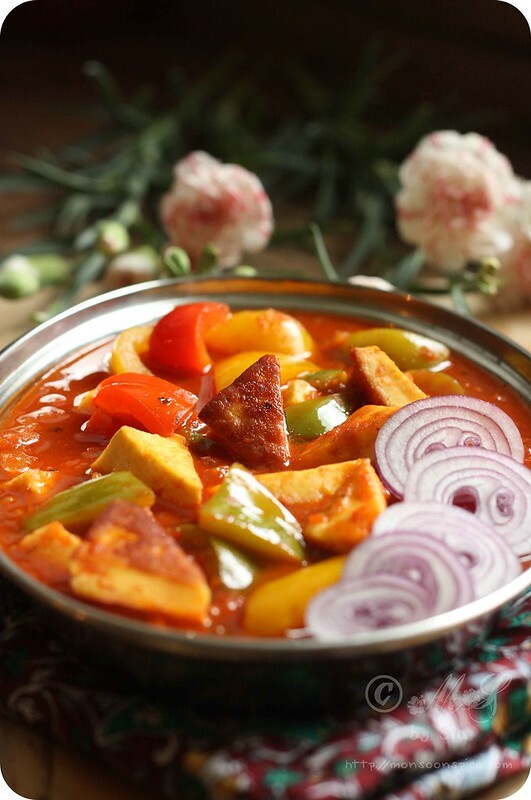 You can replace Paneer with tofu, potato or cauliflower for Vegan version. Just make sure that the potato and Cauliflower are cooked before adding to the gravy. We like our bell peppers crunchy and hence I don’t tend to cook it for long when used in any curries. If using home made paneer, simply skip the first step. Oh, you are making me drool! That dish is fabulous. Congratulations on your blog anniversary and wish you many more such milestones! 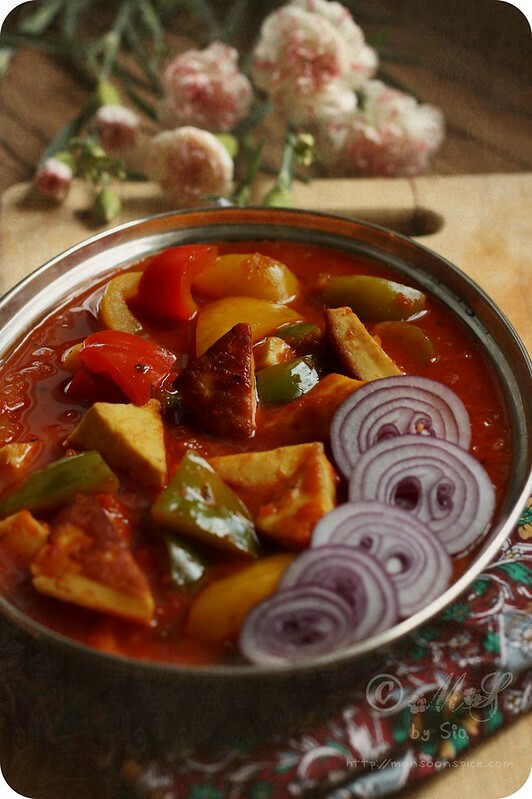 Paneer capsicum curry is mouthwatering. Congratulations, dear Sia! May MS, celebrate many more! Congrats Sia! 6 years is a long time!! congrats sia on this milestone. 6 years is a long time and your passion for cooking, clicking & blogging still going strong is worth admiration and respect. Wowo 6 years congragulations and wishing you and the delicious blog many many more happy years of cooking. Congrats on the anniversary. The gravy is mouth watering... Delicious!! I love your cooking blog... the way you give a beautiful foreword to every recipe is amazing. all your recipes are simple and pics are tempting! I have liked your FB page too. Happy 6th anniversary and keep going!! delicious yummy and lip smacking curry. Happy birthday to Monsoonspice, and thanks Supriya for making the blogosphere colourful with your stories, pictures and food..
Just wow and happy anniversary. 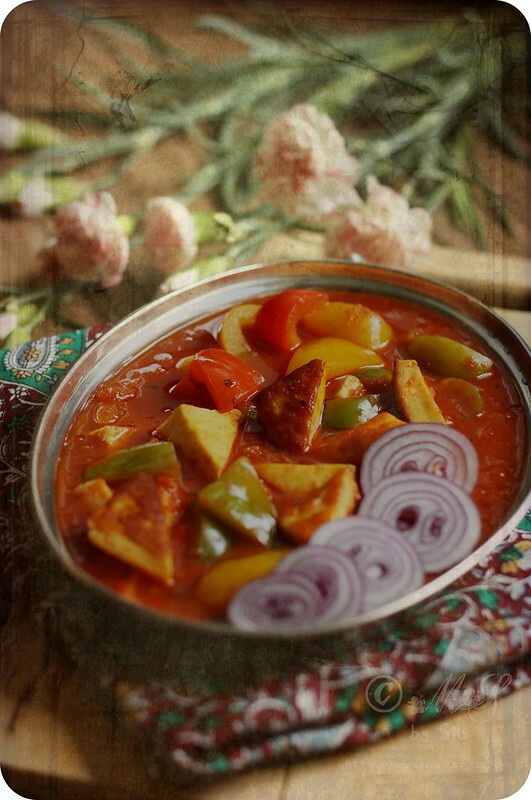 Lovely photos and I can't think of a better way to celebrate than with such a delicious paneer dish. Congrats and so glad that I was able to share in the journey. I am slowly taking a liking to paneer and this only looks delicious. 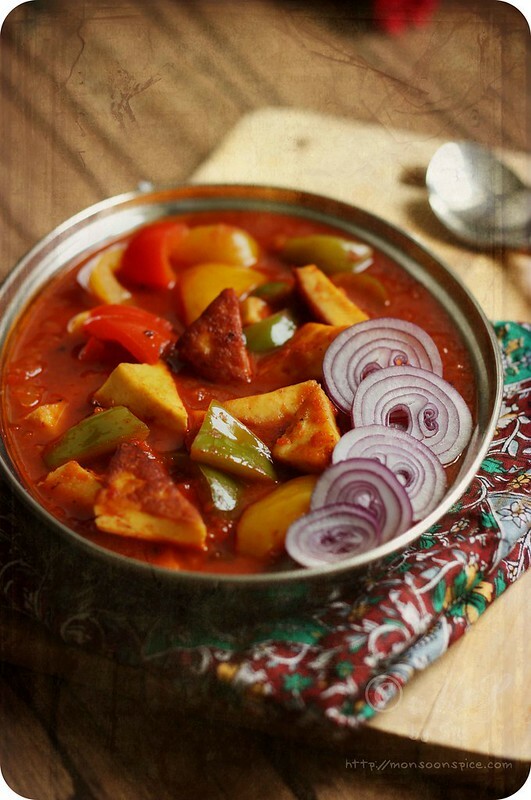 The paneer looks awesome, as all your food. And here's to many many more years ahead of blogging. :) sia 6 yrs!!! :) aweosme.. i have always been a fan of your plating... i remember clicking the pics of my khichdi and palak paneer like one of yours... you have alwys inspired me to make simple food look good :) wish you many more awesome yrs like this ahead! Beautiful pics, engaging writing and impeccable recipes. I can always count on your recipes for a perfect meal--Happy anniversary and congrats!! making this for a friends pot luck! A wonderful recipe to use that quirky little capsicum.